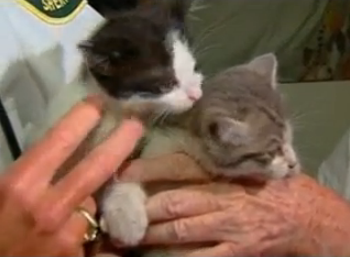 It was a happy ending for two kittens who got stuck in the wall of Joy Seward's South Florida home! Seward, a cat lover (check out her t-shirt in the video), heard meowing coming from a wall inside of her house, and was able to locate and rescue one of the wayward kitties. However, when the noise persisted, she realized that another cat was stuck, and called in a crew to assist with the second rescue mission. The dramatic moment was caught on tape, as you can see in the video above! Her wall may be full of holes now, but Seward is clearly delighted by the dynamic duo, and plans to keep them until they're adopted. From the looks of things, I'd say they aren't leaving anytime soon! @T OMG, that is terrifying! I probably would have been hysterical..I'm so glad everything worked out and that you found them safe and sound!! THat is a great rescue! We are glad she could hear them! Wow! Great rescue. We were soooooo relieved! I bet they'll find a super furever home, too--if that lovely lady can stand to let them go! OMC !!!! When they broke the wall, Look like HORROR MOVIE !!! But when the kittens got rescued...Here we are !...Cute Kittens !!!! Happy ending !!! They are safe !!! Awww... we love happy endings. Thank you for sharing this story with us! We couldn't believe how calm those kittes were when they were rescued. We think the wall may need a little tlc! !